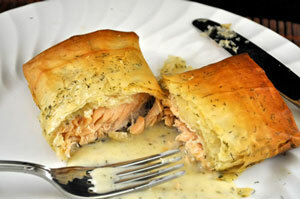 Salmon baked in Phyllo, Thyme for Cooking gourmet main course. A very impressive dish, easy to prepare, bakes quickly and makes an elegant presentation. Phyllo can be frozen twice. Rinse salmon and pat dry. Take 1 sheet of phyllo dough, brush lightly with butter, sprinkle with half of the dill weed. Place another sheet of phyllo on top and brush with butter. Place salmon on narrower end of dough about 3 inches from edge, the 'side that had skin on' down. Bring dough over salmon and fold in sides. The phyllo is now as wide as the salmon (4 inches). Roll the salmon forward one complete turn so that 'the side that had skin on' is once again, on the bottom. Cut off any remaining phyllo and discard. Brush both sides of packet with butter and place bottom side down on a baking sheet. Repeat with the other piece of salmon. Bake at 400F (200C) for 15 minutes or until golden brown. Remove and serve with Tarragon Cream Sauce on the side. In small saucepan over medium heat sauté shallots in butter until tender. Add tarragon, dill, stock and bring to a boil. Simmer 5 minutes. Mix cornstarch in stock and stir into simmering stock. Cook until thickened - should be quite thick. Remove from heat and stir in yogurt. Cover and keep warm until serving. Note: Phyllo dough is very fragile and prone to drying out. Use one sheet at a time and cover the remaining sheets with a slightly damp towel or paper towel.